The first in an enthralling new mini-series of novellas from the number-one best-selling authors of the House of Night, Dragon’s Oath tells the story behind the House of Night’s formidable fencing instructor – the love that will transform him, and the promise that will haunt him. In early 19th-century England, long before he’s a professor at the Tulsa House of Night, Bryan Lankford is a troublesome yet talented human teen who thinks he can get away with anything… until his father, a wealthy nobleman, has finally had enough, and banishes him to America. When Bryan is Marked on the docks and given the choice between the London House of Night and the dragon-prowed ship to America, he chooses the Dragon - and a brand new fate. Becoming a Fledgling may be exciting, but it opens a door to a dangerous world.... In 1830's St. Louis, the Gateway to the West, Dragon Lankford becomes a Sword Master, and soon realizes there are both frightening challenges and beautiful perks - like Anastasia, the captivating young Professor of Spells and Rituals at the Tower Grove House of Night, who really should have nothing to do with a fledgling. But when a dark power threatens, Dragon is caught in its focus. Though his uncanny fighting skills make him a powerful fledgling, is he strong enough to ward off evil, while protecting Anastasia as well? Will his choices save her - or destroy them all? I've been looking forward to this novella for a while now. Dragon Lankford was my favorite of Zoe's instructors. I always knew there was more to him than beat the eye. This is the story of how he came to be a vampire & how he fell in love with his Anastasia. The mother daughter team tie the modern day story line in perfectly. it is truely a great read! PC & Kristin Cast. Caitlin Davies was superb. I truely love narrators that act when they read. Her voice is young & refreshing. She did a truly great job! I loved this story. Dragon Lankford was a character to me that really could have used more character building in the House of Night. This book fulfill this and really lets you know about him, his love, and how he became the man he was. However I do wish a man would have read his part but overall I did like the performance. I think this book is by far the best of the House of Night series; even though this is one of the short novella's. I do not tell any of the story line in my reviews because I don't like anyone telling me any part of any book. Just let me know if it is worth my credit or not. For me, Dragon came to life in this one and end up one of my very favorite characters. I really enjoyed this one. What did you love best about Dragon's Oath? What other book might you compare Dragon's Oath to and why? I like House of Night in the present better,just because It is in the present, and with so many books the characters are well established. 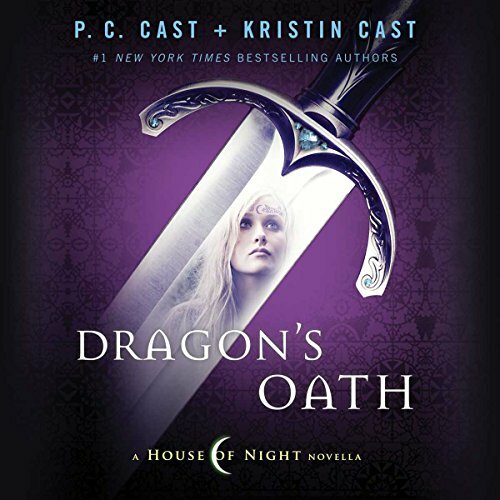 Where does Dragon's Oath rank among all the audiobooks you’ve listened to so far? Dragons Oath was just as great as all the other books in the house of night series and filed in some background information need in book nine. What was one of the most memorable moments of Dragon's Oath? The whole book brought two characters in the series to in to a clearer light that makes several scenes in book nine much more important and easer to understand. Would you consider the audio edition of Dragon's Oath to be better than the print version? Would you be willing to try another book from P. C. Cast and Kristin Cast ? Why or why not? yes, My daughter is into the house of night and talks about them alot. I also enjoy their books. Which character ??? as performed by Caitlin Davies ??? was your favorite? This was a great book. I loved hearing stories about other characters in the story. It feels like your getting the inside scoop.